In this edition of AutoCrit’s What’s the Score? we welcome a veritable titan in the world of publishing: Stephen King! A man whose work needs no extensive introduction, King’s name is almost always the first out of the hat when someone is asked to name a famous author – and with good reason. Throughout a considerable career spanning more than 40 years, King’s novels have topped the charts, won esteemed awards, directly influenced other creative artists in various fields, and found themselves enjoying adaptation to audio-plays, stage plays, television series and the silver screen time and again. One such novel is the recipient of today’s bestseller breakdown: 1983’s seminal Pet Sematary. Regarded by horror fans as one of the author’s most frightening works, Pet Sematary has now seen itself twice adapted to film – a testament to the novel’s characters, dark drama, and brooding atmosphere. And so today we resurrect King’s novel and subject its physical makeup to thorough dissection using the only system capable of such a task: AutoCrit. Once more, let’s ask… What’s the Score? DISCLAIMER: Note that this series is not designed to provide any kind of qualitative judgment nor a critique of the works dissected. As an exercise in exploration, What’s the Score? offers unique insight for us word nerds as to the linguistic makeup of specific novels, and evokes discussion of possible editing strategies in retrospect. All novels chosen for inspection have already proved immensely successful and stand as a testament to the author’s talents. While many AutoCrit users often can’t help themselves shooting for the stars when it comes to the overall AutoCrit Summary Score, we tend to find the majority of acclaimed novels actually fit into the 70-85% bracket, and Pet Sematary is no exception. With a score of 70.83, it’s further away from the cluster of novels we’ve already inspected, such as The Martian (78.65), The Next Always (77.45), The Hunger Games (80.24), and Outlander (84.11) but still within the common realm for a strong piece of work. 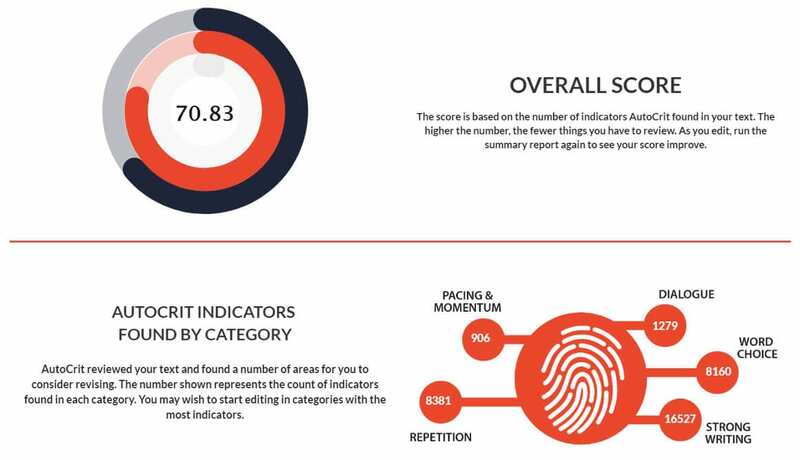 Speaking of strong – looking at AutoCrit’s fingerprint analysis, we can see the majority of indicators it’s picked up for attention are found in the “Strong Writing” category, so that’s likely where we’ll find the lion’s share of potential edits. Strong Writing always tends to be the forefront category in any initial analysis, so don’t be too worried if you see the same in your own reports. 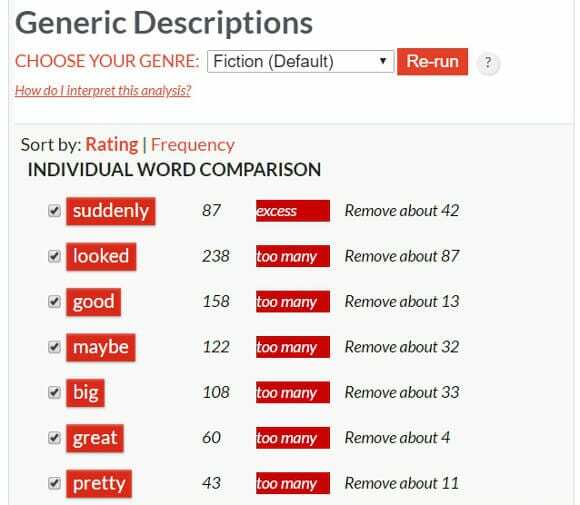 There isn’t much disparity in the number of indicators found for Repetition and Word Choice in King’s novel, and in that regard the overall fingerprint sits closest to Suzanne Collins’s The Hunger Games and Diana Gabaldon’s Outlander when referenced against previous tests. For now, though, let’s tackle each section in our preferred order. Here, King’s paragraphs don’t hang around for long, and we know that shorter paragraphs and shorter sentences often make for a snappier pace. What we do have here, though, is the “rollercoaster” effect that we like to see when it comes to variation. Note the ups and downs, like a series of hills – there’s no flat and bland storytelling going on here. The longest paragraphs appear around the middle, and especially near the end. It’s easy to imagine that these are likely to be the calm before the storm, and the climax recovery period. Going deeper, we can see a similar series of peaks and troughs in the novel’s sentence structure. It’s notable that King uses many more long sentences than the other authors we’ve inspected in this series, yet manages to keep the pacing up throughout – likely due to smart use of paragraph breaks to guide the reader’s experience. Moving on to dialogue, we always like to point out the basic rule of dialogue tags: wherever and whenever possible, always go with said or asked. It seems like King agrees and abides. Looking at the most frequent dialogue tags, said and asked are right up front. You’ll probably note that said is highlighted by AutoCrit. That simply means the system has determined overuse of that tag based on the average novel. It isn’t necessarily a bad thing if your book contains a lot of dialogue. Other highlighted tags include whispered and muttered, so they may be worth a look. Also, note the lack of screamed – a word that often finds itself terribly overused by novice horror writers, but certainly not by Stephen King. Taking a hop into the manuscript itself, we’re going to check out the dialogue tags. Here we can see that muttered appears 11 times (average is 7), while whispered appears 19 times against an average of 17. Clicking on muttered, we can hop around the manuscript and see where it appears. Mostly, it’s done by King’s lead character, Louis. He appears to be a man who mutters quite a bit. Could there be potential edits there? Or is it best left in as a consistent character trait? As always with AutoCrit, that’s up to the author to decide in conjunction with their editor’s developmental ideas. Too much muttering and a character may appear too bitter and self-absorbed to be sympathetic to the reader. Of course, we aren’t doing a complete edit here so it’s difficult to say if even one or two instances could be nixed without any negative effects on the narrative of Pet Sematary – but we also know in retrospect that Louis Creed is a well-drawn tragic figure. Next up, let’s hit some adverbs. King’s advice is generally well known among writers: the road to hell is paved with adverbs. With that in mind, how does Pet Sematary hold up? These aren’t massive changes to undertake at all, with only the uncommon hoarsely being recommended for a major trim. This definitely looks like a quick and easy editorial win. Want To See How Your Book Compares? Click Here and Try AutoCrit Today! Moving into this new category, let’s stick with adverbs for now. 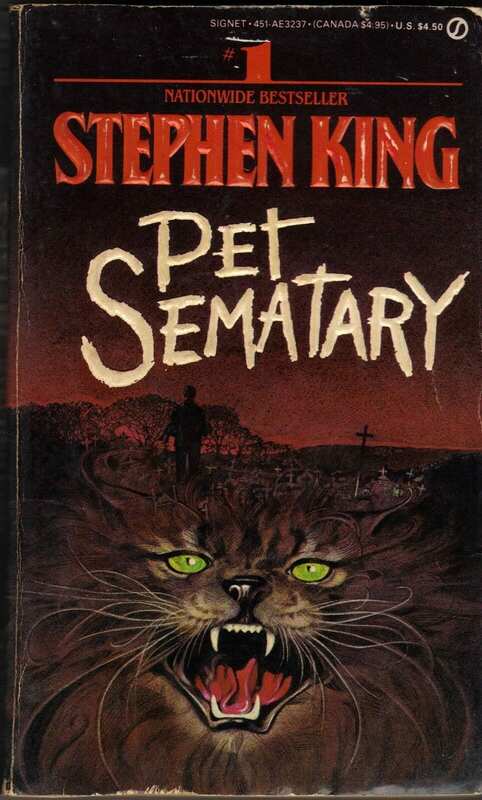 The cumulative reading for Pet Sematary sits between good and great, showing King as an author who certainly walks the walk. Once we hit the word-level breakdown, however, we’re seeing a lot of highlighted words. There’s no doubt a few of these could go (which is almost universally common), but deciding on what to change means gritting your teeth and getting down to some tough work. In this example, we’ve jumped to a point where suddenly appears twice, with both instances quite close together. These are the places you could look out for if you wanted to make a quick pass: checking each adverb individually for repetitive instances. We can also see Pet Sematary‘s number one adverb: really. What becomes immediately apparent upon reading this passage, however, is that (here, at least), the adverb is truly a function of the narrative voice. In fact, one of King’s greatest strengths is his ability to create a kind of “down-home” narrative that draws the reader into a sense of comfort and familiarity – at least, until the horror kicks in – and part of this success is smart harnessing of simple language. So while you can be fairly certain some of these adverbs could go, you should also keep in mind that with your own writing there’s always a balance to be found between the system’s recommendations and what you, as the author, are trying to accomplish. Whoa. We’re in the red zone – so it’s time to grab a drink (we won’t judge which kind) and get digging. We have 258 instances of that recommended for removal. Near the top, we can see a variation, that’s, also numbered at a removal target of 71. The problem with that is it’s commonly used to pad out sentences, yet in many cases its removal would have no effect on the legibility of those sentences. Having spent some time jumping through Pet Sematary, though, we found it hard to come up with many examples where this was the case in King’s writing. Plenty of instances of that are actually embedded in dialogue and are a consistent part of those characters’ speech patterns – as seen here with Jud Crandall, for example. On the face of it, such a change doesn’t functionally affect the dialogue – but these are decisions you’re in charge of. You’re the author. Things do hit the red zone once again, however, once we get to Showing vs. 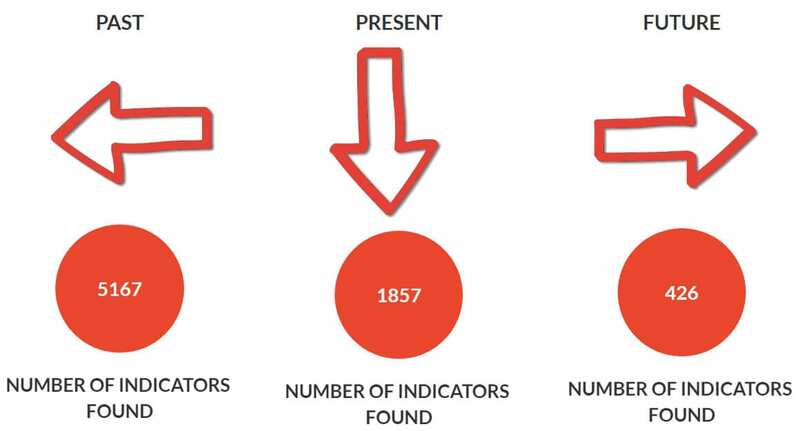 Telling Indicators. We all know that authors should show, not tell. What this means is that the narrative shouldn’t just point things out to the reader directly. Instead, the points the author wants to make should be conveyed to the reader through events and actions that take place in the story. Tricky one, here, as it is an extremely common word to use in a written narrative. There’s really no way around this one except to have a read of the manuscript with AutoCrit’s highlighting and numbered recommendations ready, and trim or adjust where possible. We can also see some of the more common (and strongest) indicators in the form of felt and heard. These are classic examples where authors might be telling the reader what’s going on instead of showing them, so those would definitely be our first targets. You’ll notice others highlighted such as saw, and this is where it’s important to bring up tense. When this is the case, you don’t need to go pulling your hair out to get rid of every single recommendation. In King’s case here, saw is obviously going to show up often. Perhaps there are ways a character could be described as having seen something – maybe through a reaction that segues into description without ever actually using the word saw. Get creative with it. Let AutoCrit’s recommendations inspire and guide you to find and try new things at different points in your story. That’s what they’re for: not to slap your hand or dictate what you do, but to help you creatively conjure alternative ways to tackle storytelling. Generic descriptions look like another area in which we could find some big wins for Pet Sematary. Among the most common, we can see looked, good, maybe, big, and suddenly. If you remember from earlier in this breakdown, suddenly was a word that also showed up among the most common adverbs – so we’d put that first in line for a checkup. Looked, however, is another matter. Remember the past tense nature of the narrative. AutoCrit sees looked as a marker of generic writing because authors will often default to saying things “looked like a…” or “looked angry” or “looked disgusting,” but that obviously won’t always be the case. Regardless, it’s definitely worth hitting the editor to check out the numbers and see where things could be tightened up. Below, we can see great, for example, should make for an easy tweak. Moving on, we have quick and simple readings for Sentence Starters (sentences beginning with an adverb) and initial names and pronouns (sentences beginning with a character name, or a standard pronoun). The Sentence Starters number looks right on point for fellow acclaimed novels, as does the Initial Pronouns. There’s little to delve too deeply into here, so let’s just geek out at the numbers for a few moments and move on. Below, we can see how AutoCrit can tell at a glance which point of view you’ve chosen for your narration. One of these should, generally, always heavily outweigh the rest. If that isn’t the case, we’d recommend you take a good long look at whether you’re being consistent or making things confusing for your reader. This one is very clear: Stephen King does not have any problem with repetition. Church is the cat who plays a major part in the story. Church is a cat and plays a major part in the story, therefore the word cat will appear more often than in your average novel. Norma, likewise, is a character. And, well, we’d probably take a minute to check out whether God appears a little too much – but we wouldn’t bet money on there being pretty much anything to change, here. Just out of interest, we loaded up the Repeated Words report in the editor anyway. Here’s an example of King’s skill with using repetition. AutoCrit will let you see at a snap where clusters of the same word occur and makes for a great way to skim on through and check that things are just the way you want them when it comes to repetition for effect. A Flesch Reading Ease score of 82 puts Pet Sematary at the “easy to read” level, meaning it’s predominantly written in basic conversational English. As we said earlier, that’s a big part of King’s success as a magnetic storyteller – his absorbing, conversational narrative flow that washes over you, pulls you in like a day with a good friend and then leads you by the hand down avenues of sheer, unexpected terror. As we’ve seen consistently with other successful novels, the score rises when placed in a suitable category for the genre of the work. It’s not a massive difference – after all, the basics don’t go out the window just because the genre changes – but it’s an indicator you’re doing well. When performing your own comparisons, just keep an eye on whether your score drops when compared to the genre in which you’re writing. In that case, try switching full-time to editing using the genre setting for that manuscript instead of the default Fiction option. Share your thoughts in the comments below, and if you haven’t yet tried AutoCrit for yourself, why not give it a go at our most popular levels for just $1. Alternatively, you can click here to enter our monthly giveaway and potentially bag yourself a full three months of membership for free! We’re so glad you liked it! Great job on your own writing scores! I enjoy using Autocrit as one part of the editing process. The breakdown of Pet Semetary is fascinating. 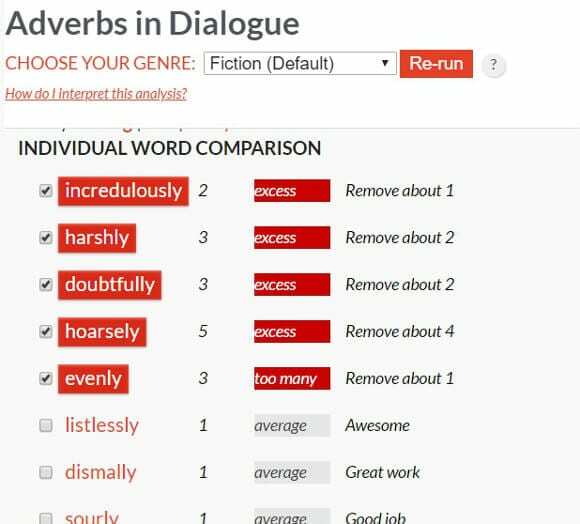 The analysis explains the mastery of King who can get away with many overused words, phrases, and adverbs by using them strategically in dialogue, or to drive a point. At first glance, one might think the book needs much more editing when in fact, all words have been deftly crafted to be included for specific reasons to move the story along and build the tension. I will be studying the analysis many times to absorb the “know when to keep words and when to edit them out”. Thank you. You’re exactly right! This is why we offer suggestions, but never change anything in the text. We understand that sometimes you need to keep the words, and sometimes they can go. This is a great example! Great work. Is there some way we can know what numbers or percentages are good? I use autocrit and am often foxed about which changes to carry. There really is no universal “good” score in AutoCrit to shoot for. We recommend using the score as a benchmark to track progress while editing. So if you started at a 65, you should see improvement to 70 or 75 over time during the editing and revising process. That being said, many of the bestselling works we run through the system end up somewhere in the 80’s. I am still in the process of outlining my novel and rely on Grammarly right now for essential editing of my writing. However, this remarkable in-depth analysis of King’s work solidifies my intention to employ Autocrit when I begin drafting my book. Fascinating and informative does not even begin to describe how powerful this software is for such an endeavor. Kudos to the creators of Autocrit. I look forward to having this in my writer’s toolbox. Hopefully sooner than later. We’re so glad you enjoyed our analysis of King’s work! We pride ourselves on having multiple tools for writers to create their best work possible. We look forward to having you as an AutoCrit member! Great initiative. I will put my 2 finished/self-published novels, for which I used autocrat, again through the autocrat mill for comparison’s sake. But even if the score is good, it does not mean the novel will ‘sell.’ The story must be good too and find an audience. That’s very true. While the pieces of a novel are important, a story that hooks your reader is very important. This is great advice! I have used Auto-crit for nearly 2 years now. It actually makes you a better writer once you start using their reports and then look at your work and what you need to correct. Its a real pain but I find now as I am typing I immediately recognize I cant use THAT or a cliché and adverbs in dialogue are taboo. “What are you doing?” I ask slowly rising from the couch. Example. This is all wrong. First you want to get rid of slowly as that is telling and not showing. Get rid of ASK as the question mark is obvious to the reader. If you are already sitting on the couch and they know it why include this? “What are you doing?” Is simple and to the point rather than throwing a bunch of words into your manuscript for words sake. the point is auto-crit points all this out to you in summaries and helps you to be a better writer. I heartily endorse Auto-Crit for every aspiring writer. We’re SO glad you love using AutoCrit and love your example. Our goal is to help writers grow and improve their craft. Thank you so much for the great review!